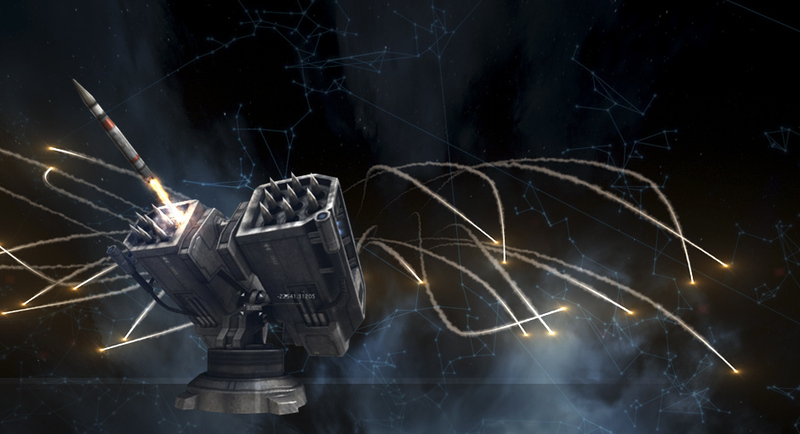 Heavy missiles used to be the dominant weapon system in New Eden. It claimed the number one spot on PvP damage and total kills by a large margin on killboard ranking systems, while also sharing similar results in PvE. That all changed with the Inferno expansion which saw nerfs to heavy missiles in multiple areas; DPS, fitting, application and range. At the time these were all necessary balance changes to bring them back to an appropriate power level, however, Inferno also introduced drone damage amplifiers and the previous patch, Crucible, brought about boosts to medium and long range turrets. 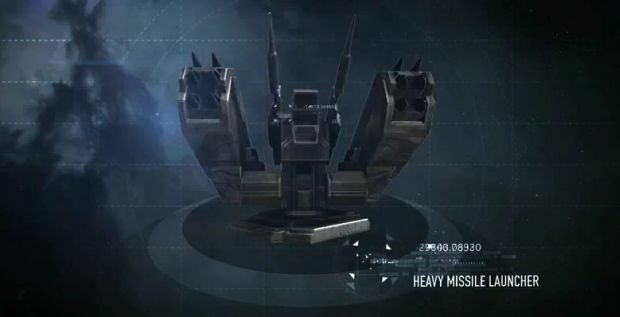 This ensured heavy missiles all but disappeared from the meta when capsuleers turned to the new opportunities presented to them by medium railguns and sentry drones. This was further compounded by the Retribution patch, which had massive repercussions for the Eve Online metagame. Every Tech I frigate, destroyer and cruiser in the game was boosted and given a role. Crucially, most of these ships were boosted in mobility, particularly base velocity, which meant in combination with the application nerfs, heavy missiles struggled even further to actually apply damage to cruisers, let alone the freshly rebalanced frigates. Assault missile launchers (AMLs), later renamed to rapid light missile launchers (RLMLs), were an anti-frigate cruiser weapon with minimal fitting requirements – basically improved light missile launchers with extra charge capacity and higher rate of fire. 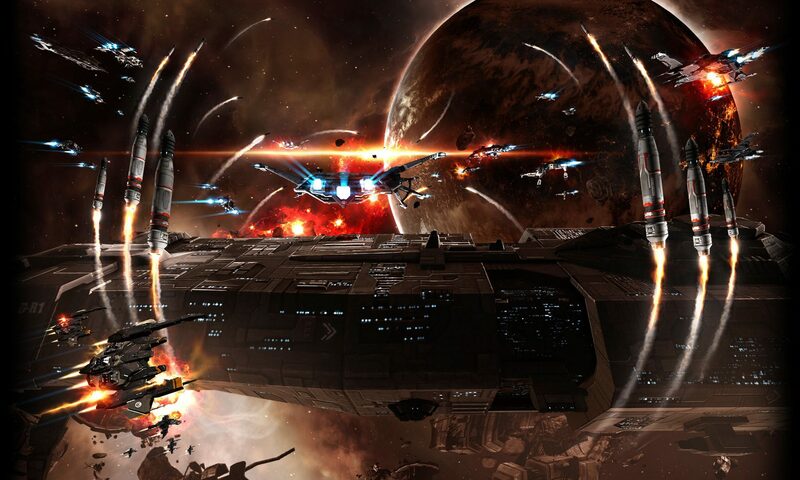 They were unpopular prior to the Retribution patch, mostly because the cheap Tech I cruiser options (Caracal, Bellicose) were lower-tier cruisers (this is not a Chessur reference, but a reference to the old ‘tier’ systems that existed prior to Rubicon, with each cruiser being exceptionally better than it’s previous incarnation in most cases – the Moa and Rupture respectively were much better than their previous cruiser counterparts). AMLs were perceived to be below the power curve and there wasn’t a legitimate cheap Tech I missile option until you reached the infamous Drake, a battlecruiser which did not get a bonus to assault missile launchers, and instead used the previously overpowered heavy missile launchers. What most people failed to correctly evaluate is that assault missile launchers were always good. They had solid, sustained DPS which came close to post-nerf heavy missile launchers, especially since heavy missile launchers (HMLs) had relatively unreliable DPS. They also used very low fitting and CPU requirements, allowing for many flexible fitting options and now that the Bellicose and Caracal were actually relevant thanks to the Retribution expansion boosts, players were starting to take advantage of them. Notably, Team Liquid used AMLs to great effect to attack young Brave Newbies in their staging systems. There are some amazing battlereports displaying the effectiveness of the platform from back then. “As you guys know, we’re introducing Rapid Heavy Missile Launchers in Rubicon for battleships that will echo the Rapid Light Launchers in design. Well, now that the current design has been out and available for discussion for awhile, we’ve taken on a lot of feedback and we don’t feel completely satisfied with them. When RLMLs were conceived there was mostly negative feedback from the playerbase, although I feel much of that feedback was from people who never truly tested them. Believe it or not, the post-nerf Svipul was thought underpowered by the majority of posters in the Features and Ideas forum, so was the Ishtar, and the Orthrus was felt to be weak because it didn’t have enough targeting range… Yep, I know. You get the picture – as intelligent as the playerbase is and with all the tools we have at our disposal, it is often difficult to tell how strong or weak something is going to be in the meta until it is used live in the game. Rapid light missile launchers were never really given a fair shake by the majority of the playerbase. Rapid lights were later boosted in one of the Rubicon point releases due to the feedback from players. Notably, the charge count for Tech II RLMLs was increased from 17 to 20, an increase of almost 18% to the damage before reload from the original proposed figures. CCP also cut the reload time from 40 seconds to 35, further increasing the power of the platform. At this point, more and more nullsec doctrines were picking up on the fact that rapid lights were incredibly strong and the downsides of the launchers could be worked around. 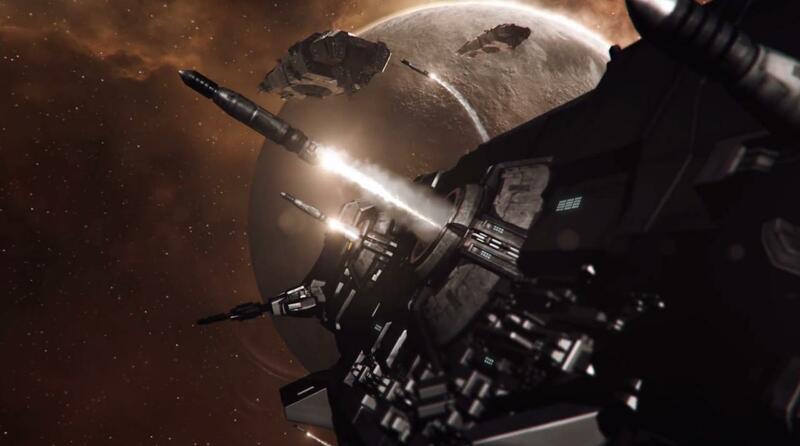 The rapid light Caracal quickly became a staple of almost every nullsec player group, and it became the most popular Tech I combat cruiser in the game, for both small-gang and as a cheap doctrine for junior FCs. Why is the rapid light Caracal so powerful? It has incredible EHP for a Tech I cruiser, thanks to the incredibly lax fitting requirements for RLMLs, you can easily get double large shield extenders, a damage control, invulnerability field(s), and either resistance or core defence field extender rigs on it. 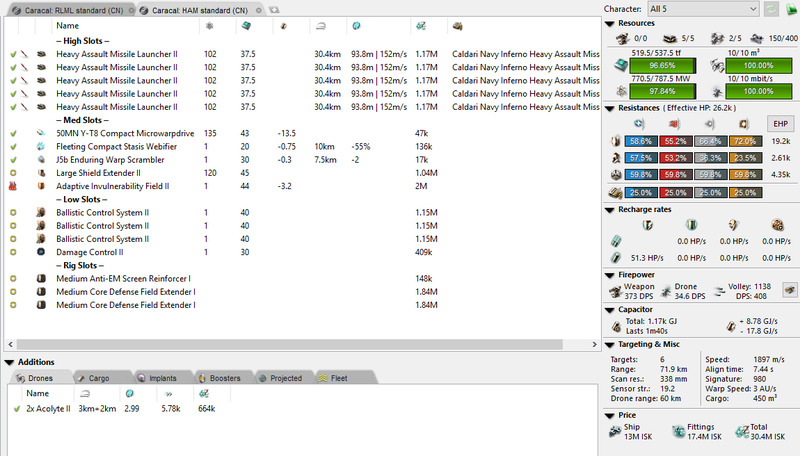 This gives it over 35k EHP while still having a warp disruptor, more if you opt for double invuls, while also sporting close-range cruiser DPS while it has charges, striking out to medium-to-long weapon range (63km with faction before modules) with the application of a frigate weapon system. It is incredibly hard to evade rapid light damage through either range or speed mitigation. They do not require capacitor to fire while missile disruptors were not in the game at this point so they were effectively ewar immune. This made the rapid light Caracal the stock doctrine and response to pretty much every light small gang, clearing grids with impunity. Small ‘elite PvP’ gangs actually started running Oracles again specifically because they could apply 700 DPS on Oracles sat just outside Caracal rapid light range. Of course, they needed anti-support of their own to function well. Rapid lights were so good, they actually out-DPS heavy missiles with Fury against every Tech I cruiser in the game (unlinked, before modules were fitted) with reloads on while still sporting medium-range (47.5km) cruiser DPS. This essentially made heavy missiles incredibly ineffective and borderline non-existent, since rapid lights were better in the vast majority of scenarios. CCP decided to boost heavy missile DPS by 5% but this didn’t change the situation, and heavy missiles are still firmly in the dumpster category of the metagame. Here is a chart of heavy missile application to Tech I cruisers assuming that they are moving at their base speeds, using Caldari navy heavy missiles. As you can see from the spreadsheet, the vast majority of untackled and unpainted cruisers have a significant damage mitigation against heavy missiles. This can become extremely broken with links, especially on logistic cruisers which have destroyer sigs, and heavy assault cruisers which enjoy 50% reduction in MWD sig bloom. So how do Fury rapid lights fare? As you can see, Fury light missiles apply perfectly to every Tech I cruiser in the game without any application boosts, where heavy missiles struggle. In the case of the Stabber, Fury light missiles apply three times better than heavy missiles. But application is meaningless without DPS figures! With reloading factored into the DPS: A Caracal with 3x BCU and rapid light missiles fitted deals 239 DPS, ignoring heat and drones. A Caracal with 3x BCU and heavy missile launchers fitted deals 284 DPS, ignoring heat and drones. 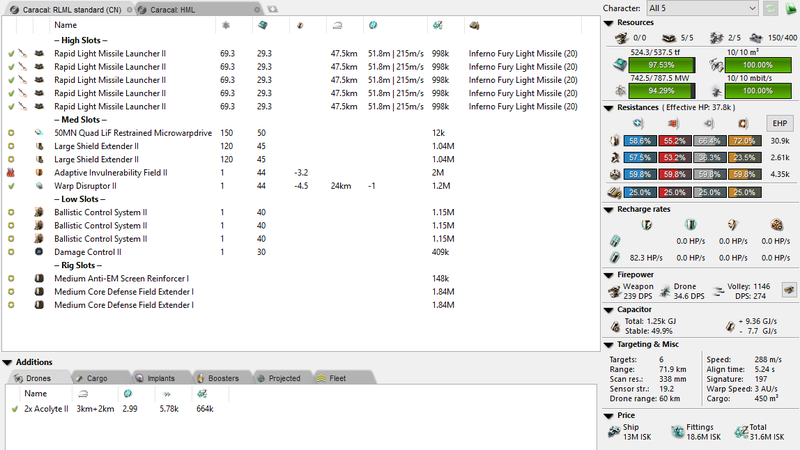 As you can see, heavy missiles on paper deal 18% more DPS than rapid lights do, and have approximately double the range of Fury light missiles. However, this is at the expense of significantly tougher fitting and reduced application. The HML Caracal in particular struggles with CPU and will usually have 10k less EHP (unlinked) than the rapid light Caracal. I would also like to point out that rapid light missile reloads on DPS is an inaccurate way of looking at the *real* DPS. The reload on time DPS is basically the absolute minimum DPS that they can deal, assuming you do a full damage clip, then a full reload cycle, then your target dies by the time your launchers reload. In practice, the DPS will actually be higher. Also, having burst DPS is obviously more advantageous than sustained DPS for breaking through local and remote repair tanks. In the non-EFT world RLMLs can often end up out-DPSing HMLs. So against untackled Tech I cruisers how much DPS is applied from each ship assuming no application modules on the HML Caracal? As you can see, HMLs at base values never out-damage rapid lights even in sustained damage against every cruiser in the game! This is before links and modules like afterburners which can paint these numbers in a far worse light. Shooting at ships which get damage mitigation options like logistics/HACs can see these numbers plummet further! To apply better damage than RLMLs on paper in the worst case scenario, HMLs require bonused or multiple target painters, or multiple application modules or rigs like rigors, removing their EHP and increasing the fitting disadvantage further, making them more vulnerable. Bringing said damage application multipliers like Huginns does not really pay off for heavy missile launchers – they do not provide enough reward for 100% damage application. Why bring HML Caracals when with Huginn/Vigil support you can bring Maelstroms/Eagles/Feroxes or a number of higher/longer DPS options which are far stronger. Even if you can get away with Fury heavy missiles, there is not enough reward. Not to mention that missile doctrines always have problems dealing with firewalls – specialized smartbombing ships positioned in front of the friendly group to destroy a vast number of the missiles before they deliver their payload. Precision heavy missiles have the exact same range as Fury light missiles, with the same DPS and worse application, and as such are always inferior. So we’ve looked at why RLMLs have completely replaced HMLs in the meta. What consequences does this have for small gang and solo? Because the rapid light Caracal does so much damage before it reloads, it completely punishes and oppresses every other attack Cruiser and other longer range options out of the metagame. A Caracal with Fury missiles deals 1008 damage per volley, for a total of 1008 x 20 = 20.16k damage. Including the Acolytes, which deal 1.39k total damage during this period, that’s 21.55k damage before the Caracal reloads it’s weapons. The 444 DPS (unheated, without reloads on) is very significant and can punch through a lot of active tanked cruisers, many of which cannot actually catch the Caracal. Here one can see the sacrifices that an attack cruiser must make in order to survive the Caracal’s Fury reload which is almost impossible (barring links) to mitigate DPS from. However, this isn’t the complete picture. The attack cruiser still needs to effectively deal with ships it is hunting. It also needs to be able to kill the Caracal which has an EHP of 35.2k (unheated) or 37.9k with the Invuln Field heated before it can actually reload. The Caracal fires all of its payload in 49.2 seconds (assuming it didn’t heat). It then reloads over 35 seconds. During this period the Acolytes strike an additional seven times doing almost 1k extra damage. This means that a Cruiser needs to kill a Caracal in 84.2 seconds before it can reload (and likely kill them with the additional 22k damage). This is also assuming the fight takes place at 0 km and the Caracal is very capable of kiting out the engagement. This requires every viable cruiser in the meta to be able to achieve at least 420 DPS with 22k EHP minimum, while also being viable at defending itself against a Svipul and other frigates, AND also being able to actually catch the Caracal. This is the reason why the Stabber and the Omen have disappeared to the depths, and to a lesser extent, the Thorax. To actually meet these minimums, they are so gimped in applying anything that they are food for any frigate or T3D that catches them. So it rotates back to the same point, if you can’t meet these requirements while not being gimped, you might as well fly the RLML Caracal instead. It also doesn’t suffer from capacitor issues like the Omen and Thorax, and doesn’t have any issues when dealing with frigates. I want to make it clear, I don’t think the Caracal is an oppressive ship – it’s rapid lights that are the problem. The Caracal is just the best example of an optimal RLML platform. A HAM Caracal with CN missiles almost dies to the RLML Caracal, living only in half structure. This HAM Caracal can survive the Reload with a heated invuln, but with only 395 DPS (unheated, reloads off), it comes dangerously close to not breaking the 420 DPS/22k EHP ratio needed to actually kill the Caracal – the HAM Caracal will actually win while deep into structure. With Rage HAMs it’s a lot closer but you run the danger of not being able to fully apply to other ships that may be present. And this is all assuming the fight starts at 0 km. The reason for this is the fitting difference between the RLMLs and HAMs combined with the fact that the latter requires a web to apply damage fully. So while, a HAM Caracal might (very barely) be able to achieve a victory against a RLML Caracal, you have to ask yourself, is it worth fitting HAMs instead of RLMLs for a minor brawling benefit, and the conclusion to that is more often than not, no. Rapid Lights allow so much more freedom in both application (no need for a web, TP, guidance mod or rigs unlike HAMs/HMLs), but also in superior fitting room. Just in case you didn’t know already, a HML Caracal dies to a RLML Caracal. This is quite unusual for EVE. It’s one of the few instances where an anti-support fitting can kill a mainline sustained DPS fitting of the same ship at 0km. I think it’s pretty clear that RLMLs are almost always better than their competition, by a wide margin. The few times where heavy missiles succeed are incredibly niche. Heavy assault missiles fare a little better but are still more limited in general than rapid lights for most PvP situations. What are some ways CCP could rebalance Rapid Lights to curtail their dominance? 1) Lowering the clip damage would help them be less suppressive against other cruisers and make them more about high anti-support burst. Right now RLMLs do so much damage as demonstrated in previous examples that they can kill many ships of the same class before even reloading. As an example, CCP could reduce the clip size from 20 on T2 to 17 (back to the pre-boost number), but reduce the reload time to 30 seconds. This would keep the sustained DPS somewhat similar, but allow a greater number of long-range fit or attack cruisers to survive the initial reload and be more relevant in the metagame. 2) Eschewing velocity/application ship bonuses to RLMLs, just like how rapid heavy launchers do not gain the velocity bonus from the Raven, or the application bonus from the Typhoon. If Caracals and Cerberus’ did not have sniper ranges on rapid lights it would ease the pressure on heavy missiles and other anti-support options like heavy beams in gang engagements. 3) Raising the fitting requirements. The fact that a rapid light Caracal can almost kill a heavy assault Caracal at 0km is testament to this being an issue. Making rapid lights harder to fit would make them less able to fit tank modules like Large Shield Extender IIs without sacrifice. This would help balance them with other anti-support cruisers which often fit highest-tier weapons such as heavy pulse and heavy beams, making fitting much more restrictive. These are just a few suggestions. Until CCP decides to cast their gaze at rapid lights, you should probably use them, and maybe heavy missile launchers will return to glory some day.